I have been aware of the spirit world since a very young age, it scared me at first though as I matured through life it brought me great comfort in knowing our loved ones continue to an a vested interest in our lives. 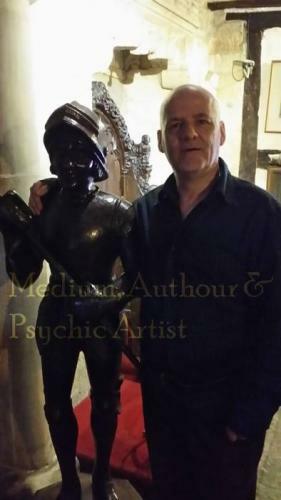 I have developed my mediumship abilities in order to more fully understand the mechanisms involved in mediumship and have over the past several taught psychic development. I am a psychic artist working with colour to produce amazing artwork that comes to represent a persons life story in a pictorial form. Dreams have always fascinated me as does the mind, as such their interpretation is an ability in which I excel. I like to provide answers even though it may not be what the reader is wanting or wishing to hear, it is about truth which I dare say is utmost in the hearts of all the mediums and psychic readers. I love to travel and experience new things, going on a holiday is about the culture and not just the pub or the beach. I enjoy physical exercise and can be very to the point. I love exploring into areas that fascinate me, I have, for instance, just begun my third year of a science degree with the Open University in order to better understand the human body, the working of the mind are especially of interest. I would ask them to be clear on what they wish to ask about, after all pennies are important these days, enter into the reading with an open mind, as a lot of the information given relates to future events, when seeking a mediumship reading there is not necessarily any guarantee that the one person you wish to hear from the most is able to evidence themselves through the medium, though someone always comes to say hello. Simply blown away. No other way to describe. No prompting, no request for anything. One question and he was off!! Didn't stop talking and all of it made crystal clear sense and understanding. The best, most honest reading I've had..thank you Ian. Such a pleasure talking today as always! Thank you so very much. So much to look forward to finally! God bless you Ian. Your gift is astounding. Never got to say thank you Ian for that brilliant reading! Tried to extend, but I couldn&rsquo;t. I highly recommend Ian! Many, many thanks again!